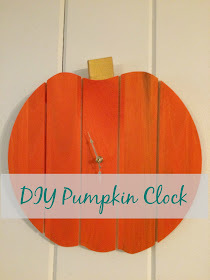 I love to decorate for Fall and have been looking for inexpensive ways to add more pumpkins to my decor. 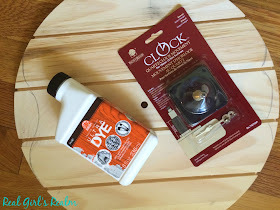 While at Haven conference, I received a round piece of wood and a clock kit (from Walnut Hollow) in the Deco Art session. 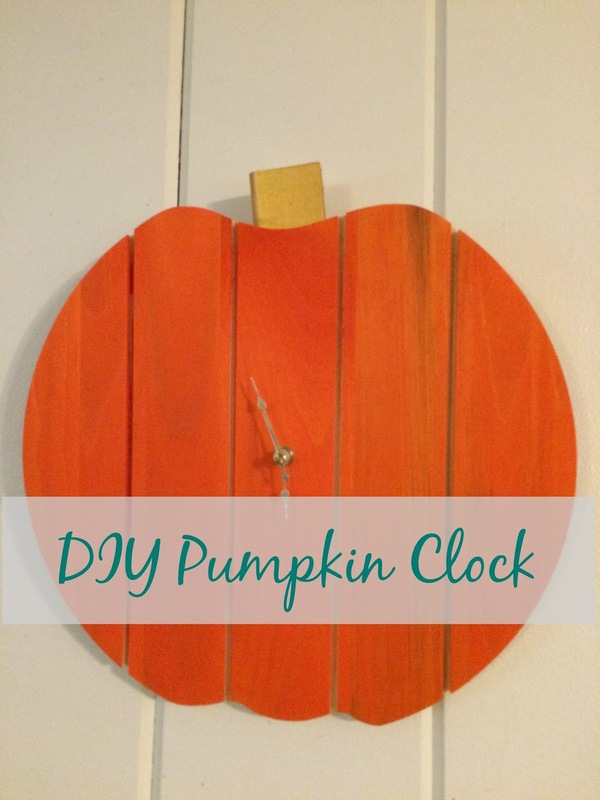 I had just been using it to stage blog photos, but one day I had an idea that I could cut it into a pumpkin shape and make it into a seasonal clock! One side of the wood was smooth and the other had a pallet look. I decided to use the pallet side and used a pencil to draw the pumpkin shape. 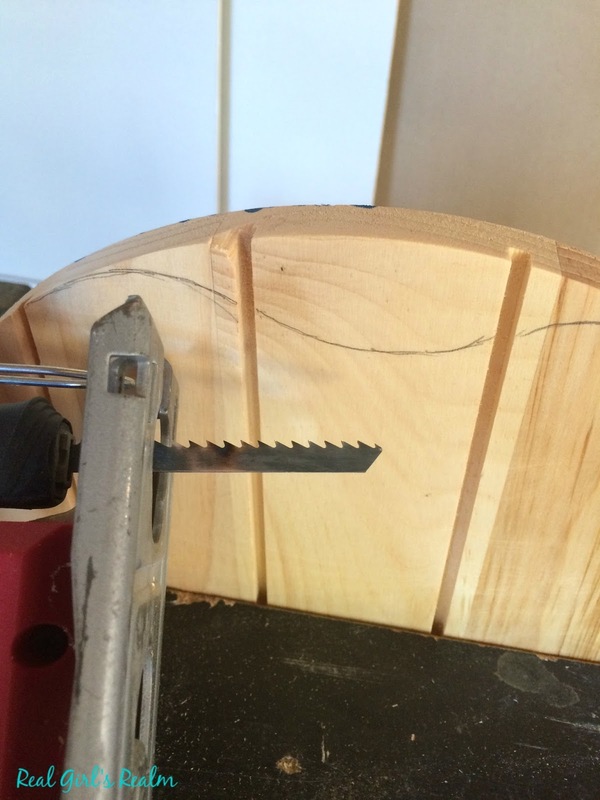 I used my jigsaw to cut the design, then sanded the edges with a corner sander. 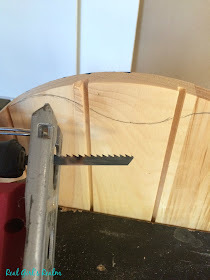 I found a scrap piece of wood that was the perfect size to use as the stem. 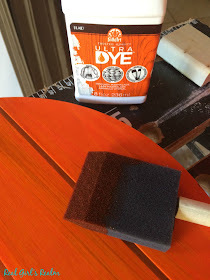 I applied a coat of Folk Art Ultra dye in Orange to the wood pumpkin using a sponge brush. 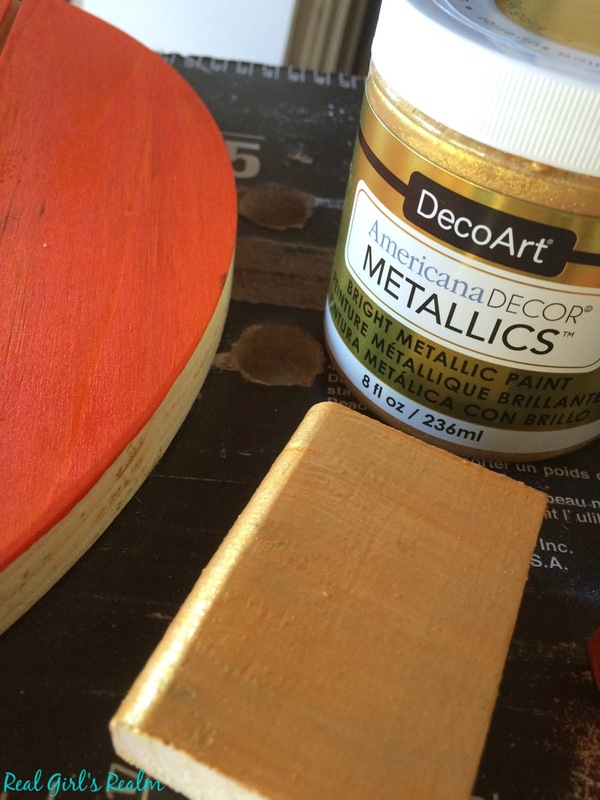 I wanted to add a bit of bling, so I used Deco Art metallic gold paint for the stem. I super glued the stem on with DAP's Rapid Fuse All Purpose Glue. 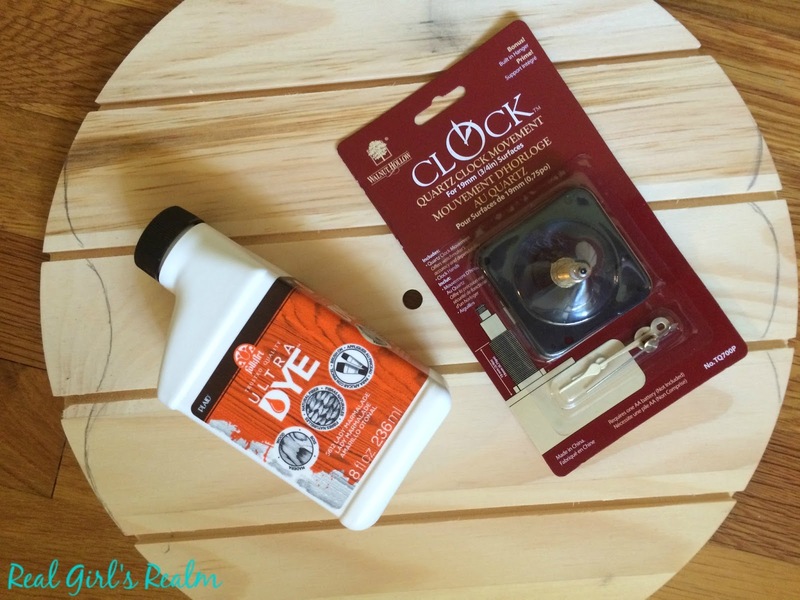 Once everything was dry, I attached the clock kit, using the hole that was already in the wood. 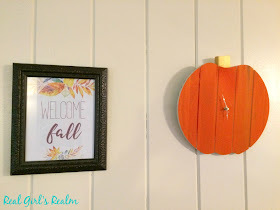 I hung it on my living room wall between two Fall printables. I am still deciding if I want to add the clock numbers, using a stencil. What do you think? Thanks Monica! I love how it turned out! Thanks Em! It was super easy with the clock kit! 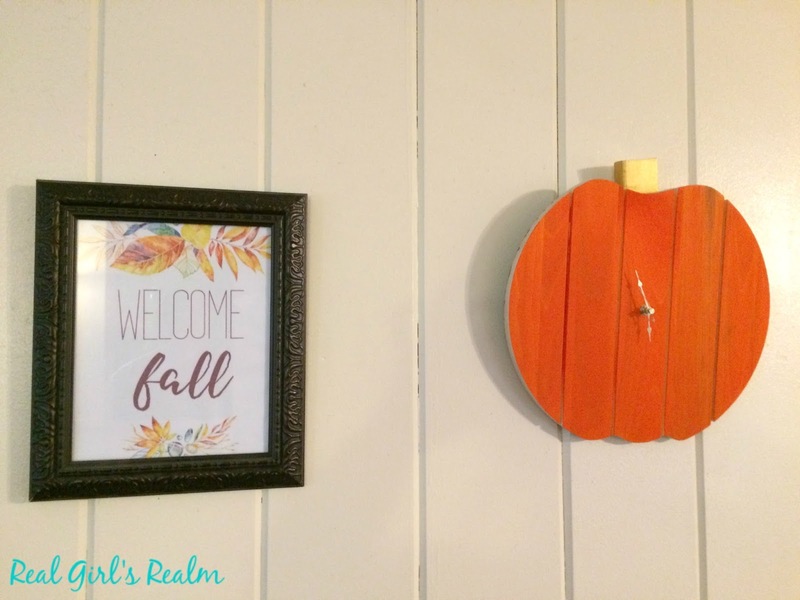 Such a cute seasonal clock! Thanks for sharing at the $10 Reader Build-off! It's so cute. Such a great idea to easily transform your decor. What a cute idea! I love how it turned out! I'm going to have to make this for next year! It was so easy, Jill! I can't wait to see yours! Oh Mary I love it. I'ts really cute and looks fun to make! Thanks Jenny! It turned out better than I expected! Great idea! 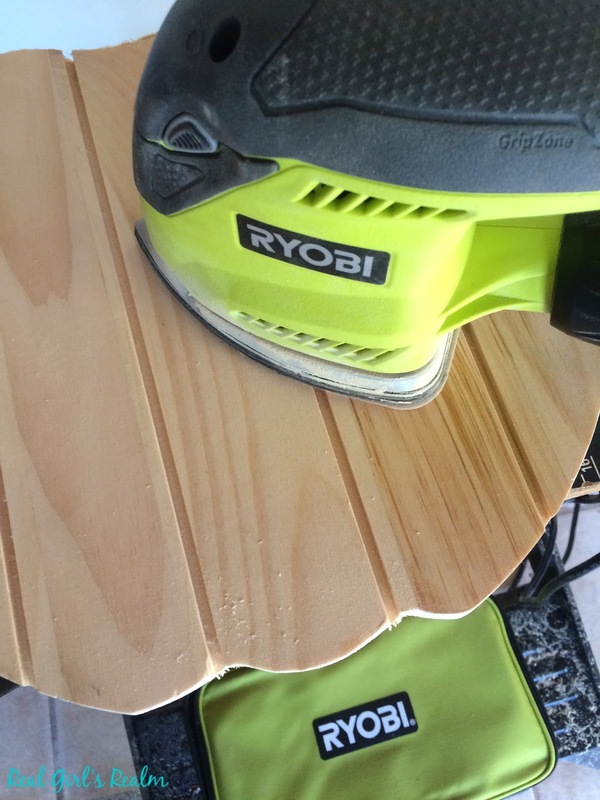 I love my ryobi tools! You used so many swag items! Love it! I know! I love using up stuff I have on hand! Great project! I love that you used some of your Haven swag to make this. I didn't make it to Haven this year but hope to go next year. Thank you! I hope you have a chance to go to Haven because it is amazing! This is so fun! I need to follow your example and us up my Haven swag! Thanks for entering the $10 challenge! Thanks! You should...so much swag to use, so little time! Very cute idea Mary! Thanks for linking up to our Power Tool Reader Challenge.